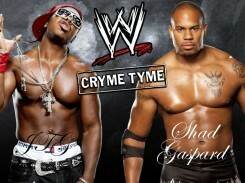 Cryme Tyme is a professional wrestling tag team consisting of JTG and Shad Gaspard. The tag team was known for his tenure inWWE. The team is an over-the-top parody of stereotypical street thugs. Gaspard qualified for the finals of the reality television program Tough Enough 2 in 2002, but was disqualified and replaced after failing a physical. He was recruited by WWE talent scout Tom Prichard and trained with DeWayne Bruce for six months before debuting in Ohio Valley Wrestling (OVW) under the ring name Da Beast. He acted as part of the stable Bolin Services, acting as an enforcer. JTG, meanwhile had debuted as Just Too Good in OVW and after two matches was repackaged as The Neighborhoodie and placed into a tag team with Gaspard, under his own name, that later used the name The Gang Stars. In OVW, they held the OVW Southern Tag Team Championship, defeating Roadkill and Kasey James on May 24, 2006 in their first match as a team. After they won the championships, they entered into a feud with CM Punk who teamed up with Kane to defeat them and Simon Dean in a handicap match. Punk and Kane won a title match but by disqualification, so the championships did not change hands. They retained the belts in a gauntlet match but later in the month lost the belts to Punk and Seth Skyfire on July 28. The following day they lost a Number One Contendership to The Untouchables (Dice Domino and Deuce Shade). The following year the team returned to OVW, this time under the name Cryme Tyme, and regained the OVW Tag Team Championship on July 21 from The James Boys (KC James and Kassidy James). They lost the belts back to them the following day. “ Tonight a new tag team, Cryme Tyme, will be introduced to the RAW audience. In an effort to humor and entertain our fans the tag team known as Cryme Tyme will be parodying racial stereotypes. Shad Gaspard and JTG do outlandish, outrageous "stunts" to ready themselves for tag team action on RAW. This attempt at Saturday Night Live like humor is bound to entertain audiences of all ethnic derivations. We hope you enjoy the weekly adventures of Cryme Tyme. The vignettes, which aired weekly, featured Cryme Tyme robbing people while an (overly and stereotypically uncool sounding) announcer dubbed their actions "training exercises" designed to work on things like "speed", "agility", "drive", "endurance", and "intensity".Cryme Tyme wrestled as fan favorites at live events and in dark matches, finally making their television debut, defeating Johnny and Mikeyof the Spirit Squad on the October 16 episode of Raw. After arriving on Raw they were depicted covertly stealing things—such as Jerry Lawler's laptop, and a plasma screen TV—duringinterviews and while celebrating wins with the announce team. On November 5, the team made their pay-per-view debut at Cyber Sunday, defeating Lance Cade and Trevor Murdoch, The Highlanders(Rory and Robbie McAllister), and Charlie Haas and Viscera in a four team tornado tag team match. Later that same month they were featured in a Raw segment that parodied Michael Richards's "Laugh Factory incident". In the skit, a wrestler (Nick Berk)—acting as a stand in for Richards—recreated the scene of the incident by using racial slurs and insults until Cryme Tyme confronted him on stage. Nervous, he offered an apology, but Gaspard kicked him in the head and JTG made a Seinfeld-esque joke, saying "What's the deal with the Bloods and the Crips? Can't they all just get along?". This event was the beginning of a series of vignettes and skits featuring Cryme Tyme interacting with different, unexpected audiences. Around the same time they began a feud with The World's Greatest Tag Team (Shelton Benjamin and Charlie Haas), during which Benjamin began to express disgust with Cryme Tyme's antics, calling them offensive and harmful to the black community. During the storyline Haas started "acting black", but after the World's Greatest Tag Team handed Cryme Tyme their first loss on the January 29, 2007 episode of Raw, the program was dropped, with Cryme Tyme appearing mainly on Raw's sister show Heat, only appearing on Raw in backstage segments. On July 21, 2007, Cryme Tyme appeared at an Ohio Valley Wrestling event and wrestled the OVW Southern Tag Team Champion James Boys (K.C. and Kassidy James), taking the title. At the next weeks television tapings the James Boys were again announced as Champions, with no explanation of how they won the title back being offered. The duo returned to Raw in July and started a gimmick where they would take items and auction them off to the crowd. This led to a feud with the World Tag Team ChampionsLance Cade and Trevor Murdoch, but both JTG and Shad were released from their WWE contracts for undisclosed reasons on September 2, 2007 before the feud was resolved. After leaving WWE they continued teaming together on the professional wrestling independent circuit, using the alternate spelling "Crime Time". They appeared at Jersey All Pro Wrestling's 10th Anniversary Show, defeating the Dirty Rotten Scoundrelz. They left the promotion undefeated after defeating Style & Finesse (Mike Donovan and Rob Vegas) in January 2008's Reclaiming Hudson. The duo also made several solo appearances on the solo circuit. Gaspard lost to Psicosis at a Pro Wrestling Alliance event in September while his partner, appearing under the altered name Jay-TG made several appearances on the Derby City Wrestling television programme. JTG and Shad returned to WWE under the "Cryme Tyme" name on the March 31 edition of Raw in 2008, defeating Lance Cade and Trevor Murdoch. Cryme Tyme began working with John Cena on the June 30 edition of Raw when they helped him interfere during John "Bradshaw" Layfield's match. The following week, they again appeared together in a segment when they vandalized JBL's limo. After a live event match, Cena confirmed that they had created a faction and announced that it was called CTC or "Cryme Tyme Cenation". Separately, Cryme Tyme started a feud with the World Tag Team Champions Cody Rhodes and Ted DiBiase, stealing their championship belts for a time, then losing a title match to them at Unforgiven. The CTC quietly separated after Cena's injury. On April 15, 2009, Cryme Tyme were drafted to the SmackDown brand as part of the 2009 Supplemental Draft. Eve Torreslater became their valet, accompanying them to the ring and appearing in backstage segments with them. Later, Eve and Cryme Tyme got into a feud with The Hart Dynasty. They competed in six person mixed tag team, singles and tag team action. On the July 31 episode of SmackDown, they became the number one contenders to the Unified WWE Tag Team Championship by defeating The Hart Dynasty, but tag team champions Jeri-Show (Chris Jericho and Big Show) beat them at SummerSlam. Cryme Tyme was supposed to compete for Team SmackDown at WWE Bragging Rights. However, due to health concerns regarding Gaspard, Cryme Tyme (along with most of the SmackDown team) was replaced by Matt Hardy, R-Truth, The Hart Dynasty and Finlay. On the March 5 episode of SmackDown!, they had a No.1 Contender's match to fightThe Miz and The Big Show for the Unified WWE Tag Team Championships against John Morrison and R-Truth and The Hart Dynasty, however they failed to win the match. The following week on SmackDown, Cryme Tyme were facing Hart Dynasty but were attacked by The Undertaker. At WrestleMania XXVI, both members of Cryme Tyme competed in the dark match battle royal, where JTG would be eliminated by Shad. Just days later on SmackDown!, after a quick loss to R-Truth and John Morrison, Shad was enraged and attacked JTG for not coming to his rescue in the match turning Shad heel for the first time in his WWE brand career and second time in his wrestling career. (The first being his debut in OVW). Backstage after the match during an interview, Shad told Josh Mathews, "No more Time... no more Cryme Tyme...this is my time." The next week, Shad came to the ring and announced that he was done with Cryme Tyme and announced again that it was his time. Afterwards, an enraged JTG came out ready to fight Shad, but got kicked in the face by Shad for his troubles. The week after that Shad attacked JTG again, after his match withCaylen Croft, though JTG would get the upper hand on Shad. Five days later, they faced each other at Extreme Rules in a Strap match, which was won by JTG. The two had a standard rematch on the May 6 edition of WWE Superstars, which Shad won by pinfall, thus ending their feud. Shad was then sent to FCW developmental territory, while JTG stayed on Smackdown. Shad was later released from his WWE contract on November 19, 2010 along with five other wrestlers. A few months after he was released from WWE, Shad Gaspard signed with Japanese wrestling promotion IGF in February 2011. He is also focusing on his acting career, having shot his part in G.I. Joe: Retaliation, which was released in March 2013. In June 2012, Gaspard accused the Prime Time Players (Titus O'Neil and Darren Young) onTwitter for ripping off the team's gimmick. Gaspard bashed team in a rap, accusing Prime Time Players of stealing their gimmick: young, disrespectful, jive-talking, culturally insensitive showboats. JTG was released from WWE on 12 June 2014.